Heat the oil in a large pan. Place the garlic, ginger and leek slices in the pan. Cook for 5 mn. Break the asparagus in two and add them to the mix. Continue to cook on a medium heat for another 15 mn stirring occasionally. Add the Chinese wine or the Xérès and let it reduce. Pour 1 litre of water and the cube. Cook for 20mn. Mix the corn flour with a little water and add to the soup. Boil for a few seconds until a thicker consistency is obtained. 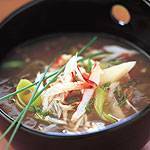 Pour the soup in bowls and sprinkle with chives before serving. Slice the beef in ½cm strips. Mix with the shallots, the oil and the soya sauce. Microwave the vegetables for 4 mn at 900Watts. 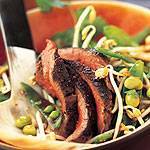 In a non-stick pan or in a very hot wok, seal the steak slices for 3mn, mixing often on a high heat, add the vegetables, the coriander and the sesame seeds, fry for 3 mn mixing well and serve immediately. Cut the breast in fine strips. Boil the peas for 5 mn in salted water and then drain. Fry the onions in a pan using half the oil, then set aside. Dice the tomatoes, add them to the rice together with the mint and salt and pepper to taste. Cook until re-heated. Meanwhile, fry the chicken strips for 5 mn using the remaining oil, pepper, add the onions, the nem and soya sauces, sugar, lemon juice and cook for 3 mn.Add the petits pois and cook for an additional 2mn. Slice the filet mignon into fine strips following the grain. 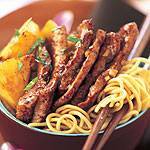 Mix in a bowl 2 tablespoons soya sauce, the sesame oil, the cornflour and marinate the meat in it for ½hour. 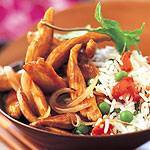 Place a wok or a large pan on high heat and fry the garlic in the groundnut oil for a few seconds. Add the pork and stir until golden brown. Add the pineapple pieces, the coriander and the mint. Fry on a high heat for another 2 to 3 mn. Pour in the remaining soya sauce and add the sugar. Stir once more and serve immediately. Deliciuos! made that last night :] damn thats some good stuff! do you reccomend anything else? please?! hmm seems like a good dish :] im making that tonight. mMmmm!